Six British soldiers were missing and believed to have been killed after their Warrior MICV was hit by an explosion while they were on patrol in Helmand, reports the Reuters news agency. The soldiers, five from the 3rd Battalion the Yorkshire Regiment and one from the 1st Battalion The Duke of Lancaster's Regiment, were on a mounted patrol when their vehicle was struck. This brings the total number of British military deaths in the theatre since 2001 to 404, topping the 398 recorded on 13 February when SAC Ryan Tomlin was shot dead while on a routine patrol in the Western Dashte area. This is the largest number of deaths from a single incident since September 2006 when 14 British personnel were killed in the crash of the Nimrod MR2, and is the most deadly single incident involving Army personnel on ground duties. Given the significance the media attach to century events, there must be a suspicion that the media-savvy Taliban have mounted a "spectacular" to maximise media impact, and thus the embarrassment for British political leaders. If that was the case, then - from their perspective - they have chosen well. 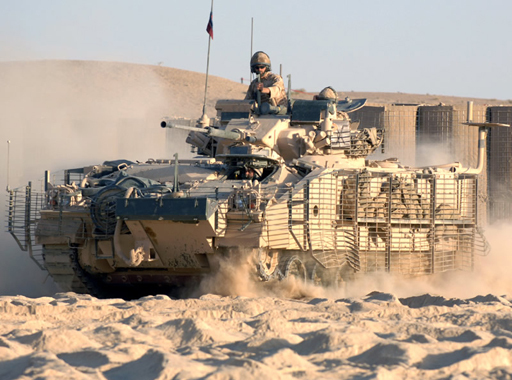 Although the Warrior is an impressive-looking vehicle, with considerable ballistic protection, it is dangerously vulnerable when exposed to mines and IEDS, reflecting the traditional reluctance of British military specifiers to incorporate such protection in their armoured vehicles. For its precise role, however, there is nothing else that can provide its combination of off-road mobility and fire power, and it has been a valuable attribute in so-called "kinetic" operations. Unfortunately, the Taliban have shown themselves only too well aware of British vehicle vulnerabilities and, in this case, seem to have exploited the limitations of the Warrior to particularly deadly effect. The explosion occurred on the main A1 highway, a tarmacked surface, so it was almost certainly a culvert bomb of the type that gave our troops in Northern Ireland so many problems. The incident comes at a times when domestic political stresses are already pre-occupying British leaders, and this stark reminder of a "forgotten" and unpopular war can only serve to reaffirm the political determination to pull out before the next general election.